Catfish On The Lake: The Return To Black Lake......Part III, "Settling In Saturday"
The Return To Black Lake......Part III, "Settling In Saturday"
The view from our cabin on Black Lake, on a calmer day. Weather:Cloudy. Windy as hell. 25+mph SW blow. Moon:Waxing, 5 days before full. 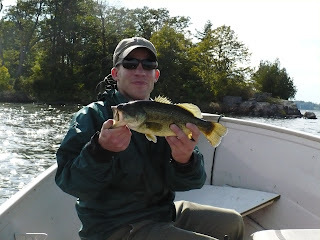 After much anticipation, an early departure, a 6 hour drive and a stop at the Hammond Fair, Chris and I quickly checked-in at our lakeside cabin (check out http://www.thelogcabins.com/) and got right to fishing. In addition to our modest, 2 bedroom cabin, we rented a 16-foot aluminum V-hull with an 18-horsepower engine. With our bags on our beds, we quickly headed out onto Black Lake. Black Lake greeted us with a stiff wind. Although I had plenty of spots marked on the map, they were going to have to wait. Most of the lake was inaccessible due to the breeze and whitecaps, so anything more than a short ride was out of the question.